Here at Ardel Engineering & Manufacturing not only do we provide a number of in-house secondary value added services for all machined parts, we are also willing to offer and manage turnkey complete parts and assemblies using our certified subcontract vendors. Ardel Engineering and Manufacturing is capable of the following types of anodic coatings: Type I Class 1 (chromic acid anodizing – non-dyed), Type I Class 2 (chromic acid anodizing – dyed), Type II Class 1 (sulfuric acid anodizing – non-dyed), Type II Class 2 (sulfuric acid anodizing – dyed), Type III Class 1 (hard anodize – non-dyed), and Type III Class 2 (hard anodize – dyed). These specifications are only used for military and aerospace products and can ensure corrosion resistance, fatigue resistance, and outstanding pain adhesion. MIL-DTL-5541 Type I chemical film, refers to the use of hexavalent chromium. The coloring of this film usually appears to be gold or brown in color, but can be clear. MIL-DTL-5541 Type II chemical film refers to using components containing no hexavalent chromium. This is typically clear in color. Utilizing MIL-DTL-5541 chemical film can ensure maximum protection again corrosion, whether painted or unpainted, and where low electrical resistance is required. Our grinding capabilities include centerless, contour, taper, and wet grinding, just to name a few. In centerless grinding, the outer diameter of a part is ground without restraining the workpiece. When set up correctly, centerless grinding can be used to not only refine the surface finish, but improve the roundness of a part at the outer diameter. 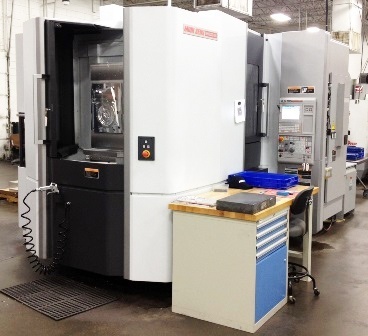 Complex grinding processes, such as contour grinding and taper grinding, can be used to finish numerous types of low volume projects such as prototypes, fixtures, and tooling. We can provide surface finishes on the level of 0-2 RMS on complex parts, and on more than one occasion have astonished customers with the quality of workmanship we are able to provide. Our honing capabilities include honing of tubes, blocks, molds, or complex shapes, made of various metals, plastics, ceramics, or composite materials. During the honing process, honing stones are used to abrade the part surface, removing imperfections and creating a smoother, flatter surface. In the case of cylindrical components, honing processes can be used to create a truer surface, improving the roundness of the inner diameter. The characteristic cross-hatch pattern left on the metal surface after honing is also very desirable for retaining fluid-based lubricants in mechanical applications. Due to the simplicity of the tooling and ability of the tool to improve the roundness of the part, there are many instances in which honing is a faster and more accurate option than ID grinding or hard turning processes. However, Anodizing MIL-A-8625, MIL-DTL-5541 (also known as MIL-C-5541) Chemical Filming, Grinding, and Honing are not the only value added services Ardel Engineering & Manufacturing can provide. We are also capable of performing many other processes, such as: passivation, heat treating, electroplating, drilling, tapping, laser cutting, and waterjet cutting, and many more. Please contact us directly for more on our value added services that Ardel Engineering and Manufacturing can offer you. Many steps go into manufacturing a complex part, which is why it is crucial to maintain a cooperative effort across all departments in order to achieve high quality, cost effective parts. Explore how to achieve this goal in our in-depth eBook that offers design tips for machining parts. CNC machining refers to Computer Numerical Control, a system that uses computers to control and move a machine. Most often these milling tools are used for metalwork, but they can also make products for a variety of industries. With the ability to craft sophisticated designs using an assortment of metals, engineers can fabricate precise communications equipment using CNC machining. Aluminum once made up the bulk of the material used in aerospace applications. Aluminum accounts for as little as 20% of the materials used in a typical jet today, however. Composite materials, carbon-reinforced polymers, and honeycomb materials are increasingly seeing usage across the aerospace industry because of the demand for lighter-weight aircraft. Milling is one of the most common machining processes available. It can be used to machine a wide variety of materials such as metal, wood, and plastics, but the best milling machine for a particular project depends on the complexity and requirements of the specific design. © 2019 Ardel Engineering and Manufacturing Inc.